Matthews North Carolina personal injury and auto accident attorneys and Charlotte North Carolina personal injury and auto accident and motorcycle accident attorneys. We help you get punitive damages. that either fraud, malice, or willful or wanton conduct was present and related to the injury for which compensatory damages were allowed. N.C. GEN. STAT. § 1D-15(a)(1)(2)(3). These aggravating factors must be proved by clear and convincing evidence. Punitive damages will not be awarded solely on the basis of vicarious liability for the acts or omissions of another. A defendant will not be required to pay punitive damages unless that defendant participated in the conduct constituting the aggravating factor that gave rise to the punitive damages. Similarly, officers, directors, or managers of a corporation will not be required to pay punitive damages unless they participated in or condoned the conduct constituting the aggravating factor that gave rise to the punitive damages. Punitive damages may not be recovered in a breach of contract action. N.C. GEN. STAT. § 1D-15(d). When awarding punitive damages, the jury is required to determine the amount of punitive damages separately from the amount of compensatory damages. The plaintiff may not receive a punitive damages award that is more than three times the amount of compensatory damages or more than $250,000, whichever amount is greater. The trial court has the authority to reduce the amount of a punitive damages award returned by the jury if the award exceeds the maximum statutory amount. The jury may not be informed of the statutory cap on punitive damages, nor that the court has the authority to reduce the jury's punitive damages award. The defendant may move to have the action decided in a bifurcated trial, where the issues of liability and compensatory damages are decided separately from the issues of punitive damages. 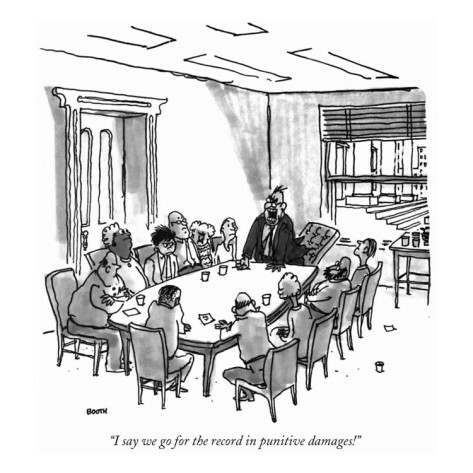 The same jury that tries the issues relating to compensatory damages must try the issues relating to punitive damages. the defendant's ability to pay punitive damages. A plaintiff or defendant who files a claim for punitive damages or asserts in its defense a claim for punitive damages, which the claimant knows or should have known to be frivolous or malicious, will be required to pay reasonable attorney's fees to the opposing party.